Not surprisingly, along with significant sales and dollar volume increases, listings came roaring back too compared to the same month last year with a 17% year-over-year increase. So it is no coincidence sales were ahead by the same percentage as eager buyers took advantage of fresh inventory to choose from. Despite an improvement in listings supply, there is still less than 3 months of residential-detached housing available going forward to meet the demand if there were no listings coming on stream. As a result of April’s strong showing, year-to-date sales which had fallen behind last year at the end of the first quarter are now back in the lead and dollar volume widened its gain over 2011 by a 10% margin. April MLS® unit sales increased 17% (1,346/1,148) while dollar volume went up 25% ($337.3 million/$268.8 million) in comparison to the same month last year. Year-to-date sales are up 4% (3,829/3,681) while dollar volume has risen 10% ($926.4 million/$839.3 million) in comparison to the same period last year. Listings entered on the MLS® system this year are up 5% with well over 6,000 listings. To show just how much buyers in the local market are putting a premium on available listings, there were more above list price sales than there were below list price in April and the average sale price for above, below or at list price residential-detached sales all centered around the $280,000 price level. For residential-detached sales in April, the most active price ranges were the $200,000 to $249,999 and $250,000 to $299,999 price ranges. They were only two sales apart and each contributed 20 % of total sales. It may be time to fold the $0 to $99,999 price range into the next higher one as it only represented 3% of all sales in April. As for condominium sales activity, while the $150,000 to $199,999 price range is still dominant with 34% of total sales, you are starting to see more of a shift towards the $200,000 to $249,999 price range as it grabbed another 21% of condominium sales in April. Average days on market for residential-detached sales was 26 days, one day slower than last month and the same pace as April 2011. 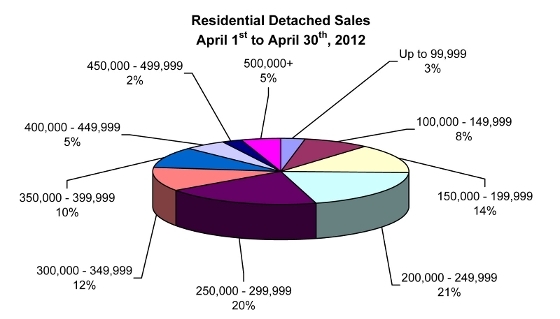 Days on market for condominium sales was 37 days, 6 days off the time set last month and 3 days slower than April 2011.